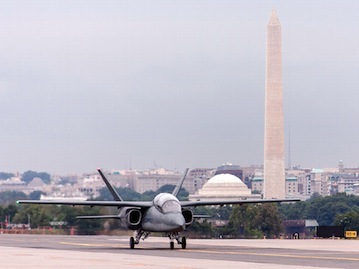 Textron AirLand, LLC, brought its Scorpion ISR/Strike tactical jet to Washington, DC for the Air Force Association’s Air & Space Conference. The aircraft was displayed at Signature Flight Support Terminal at National Airport (DCA). Alt Gobo was contacted to record video of the jet’s arrival. The crew was given access to various parts of the airport closed to the public. The vantage point that was used is currently the observation deck used for the weather station on top of the old terminal. The Scorpion is a sub-sonic aircraft that seats two. The multi-mission flexibility of the aircraft will feature a variety of multi-spectral sensor and high-definition video camera packages engineered for intelligence, surveillance and reconnaissance missions. It can be armed with several wing-mounted munitions representing a typical array of air-to-surface and air-to-air weapons preferred by the US and partner nations.